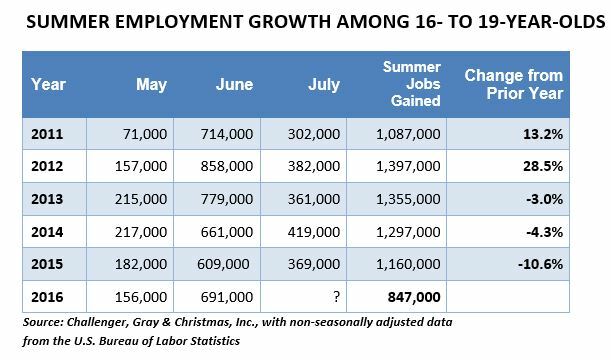 Teen Summer Update: June Surge to Highest Gains in 3 Years | Challenger, Gray & Christmas, Inc. The 691,000 employment gains recorded last month represents a 13 percent improvement over June 2015, when 609,000 teenagers found employment. The Challenger analysis is based on the latest non-seasonally adjusted data released earlier this month by the U.S. Bureau of Labor Statistics. The June surge came on the heels of weak hiring among teens in May, which saw the fewest employment gains for 16- to 19-year-olds (156,000) since 2011. However, summer hiring is now outpacing 2015. Through the first two months of the three-month summer hiring period, employers have hired 847,000 teenagers, a 7.1 percent increase from a year ago, when teen job gains in May and June totaled 791,000. Overall teen employment reached a non-seasonally adjusted 5,548,000 in June. That is up 4.0 percent from a year ago and represents the highest June employment level for this age group since 2009, when 5,608,000 teenagers were employed. “Teenagers may be benefitting from a resurgence in the fast food industry. Unlike traditional retailers, which appear to be closing locations as more people shop online, food establishments are expanding. The Sonic drive-in chain added 16 new locations in the quarter that ended May 31. Moreover, there has been an explosion of new restaurants offering healthier alternatives to traditional fast food fare,” said John A. Challenger, chief executive officer of Challenger, Gray & Christmas.